Trying to find ways to keep the clothes looking ironed while also having to carry them to and from work can sometimes be a hassle. 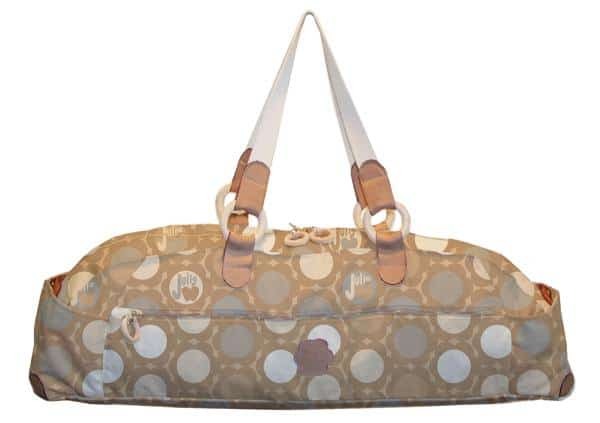 Thankfully though there is a bag that keeps the clothes straight and also provides room for the yoga mat. It is in the shape of a garment bag that has straps at the top and bottom. When folded there is space that the mat can sit without crinkling the clothes. There are also zippers for phones, change, and other random goodies. Yogis that like to stay trendy on the way to and from the studio also have options. One of the totes available is extremely versatile and different than all the rest. Rather than having to carry the bag the same way every day, this bag can take the shape of a messenger or a tote bag depending on what the preference. There are loads of various compartments throughout the bag as well. The sporty people have the option of getting another type of tote. This is made of nylon and is waterproof, which can be handy when going to hot yoga or the sweaty gym. It looks like a large purse but allows the mat to sit on top of it. Depending on what size and shape sounds good, these can range in price from $70-$100. Then there are people that just need the very basics. There are the general straps that either have Velcro on each end, or have adjustable straps that fit tightly around the mat keeping it secure. This has a single strap that can be either thrown over a single shoulder or across the body. Choosing a nylon zippered bag is another great option that keeps the cost low but give a bit more protection from the weather. This is the cheapest and most lightweight option available, other than just carrying it with no straps. There are also bags that have hand embroidery, which is a great way to stay unique and have a bit more personality to them. This is also an easy way to find the bag and catch anyone that tries to snag it due to their envy. Then there are bags that are environmentally friendly. One in particular is made out of water resistant recycled plastic bottles. This is actually in the shape of a regular backpack with two straps that can go over the shoulders, making it a great bag for cyclists or those that need a bit more security on the way to the studio. These are just a few different options of out there. By figuring out what is needed for the studio, how one is getting there, what the budget is, and how important style and comfort are, the options can be limited down quite a bit. Can Blockage in the Ajna and Sahasrara #Chakras Contribute to Migraines?